Drew and Jonathan Scott are at it again. Today, HGTV announced the Scott brothers will return for a fourth season of Brother vs. Brother. 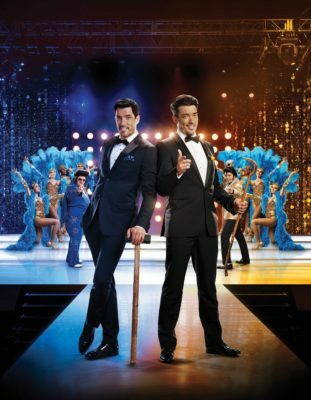 The series features the Property Brothers stars competing to buy and renovate a Las Vegas home with a $500,000 budget. The new season premieres on June 1st at 9 p.m. ET/PT. New York [For Immediate Release—April 28, 2016] Budgets are bigger and the stakes are higher as Drew and Jonathan Scott go head-to-head in Las Vegas for HGTV’s fourth season of Brother vs. Brother. Premiering Wednesday, June 1, at 9 p.m. ET/PT, the six-episode series will follow the popular twins as they compete to buy, renovate and sell a Vegas home—each with $500,000 to spend. Refereed by their older brother JD, Jonathan and Drew will battle to win weekly challenges by impressing an illustrious panel of HGTV and DIY Network expert guest judges. In the end, the Brother with the highest net profit after their home’s sale will emerge victorious in the competition. HGTV guest judges, Lex and Alana LeBlanc (Listed Sisters), Anthony Carrino and John Colaneri (America’s Most Desperate Kitchen), Egypt Sherrod (Flipping Virgins), David Bromstad (My Lottery Dream Home), Tiffany Brooks (HGTV Smart Home) and DIY Network’s Vanilla Ice (The Vanilla Ice Project), will decide who wins each weekly match. During the series produced by Scott Brothers Entertainment, with Jonathan and Drew as executive producers, the challenge loser must face embarrassing dares such as wearing a showgirl costume in front of a famous Las Vegas landmark, being sent to clean priceless cars with a toothbrush or playing the jester in a live-action medieval dinner show. New this year, the challenge winner gets a classic Vegas-style reward such as performing the trapeze in a circus act, playing a part in the legendary illusionist David Copperfield’s show or taking a private tour of singer and entertainer Wayne Newton’s Las Vegas estate. “Last year it was a tight race, but I managed to take the win,” said Jonathan. “And as the oldest brother, I’m here to keep these two on track with the rules of the game and to make fun of the biggest loser,” joked JD. Beginning on Wednesday, June 1, fans can visit HGTV.com/brothers to watch Drew and Jonathan’s weekly design tips in the new digital content “Brothers vs. Judges” and take a tour of the #TeamJonathan and #TeamDrew spaces. They also can check out exclusive extended footage from JD who will be sharing a behind the scenes look at the Brothers’ on-air and uncensored dares. What do you think? Have you seen Brother vs. Brother? Will you watch the new season? Who do you think will win? More about: Brother vs. Brother, Brother vs. Brother: canceled or renewed?, HGTV TV shows: canceled or renewed?